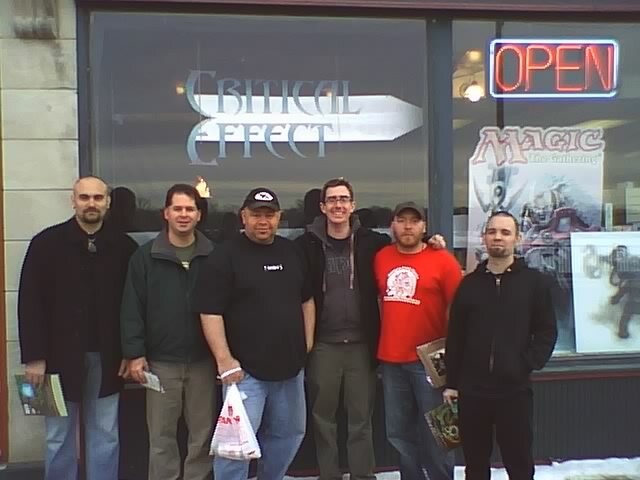 Critical Effect is a full-line game store with a great selection of "gamer games" - a full selection of RPG's, tabletop miniatures, card games, board games, and more. If you're looking for a place to browse for a long time, this is a good place to go. They have several gaming tables in the back and a packed-to-the-brim gaming schedule, with events every night of the week. They stock the complete Goodman Games line, participate in industry events, and attend the industry trade shows. They even have our old Adventure Finder poster from the 3.5 era posted on their wall! Critical Effect has a section of old lockers which they rent to gamers who use their open play area. 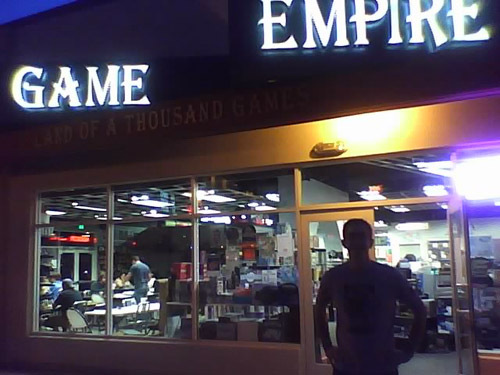 Endgame is a spacious full-line game store. The store has two floors, with product on the first floor and ample gaming space on the second floor. The door opens to popular board games. There's an alcove off to the side with a large selection of RPG's and several miniatures lines, including a full selection of GW miniatures. Endgame stocks Goodman Games in limited quantity due to the heavy RPGA activity there, but has a large RPG selection overall and carries Goodman Games products that will interest its clientele. It has a "mom lounge" where non-gamers can park while significant others shop. The gaming area upstairs is awesome - I counted six miniatures tables with terrain, ten tables for card and board games, and cabinet after cabinet of miniatures terrain, including some real high-end foliage emplacemnents. It makes me want to start playing 40K again. 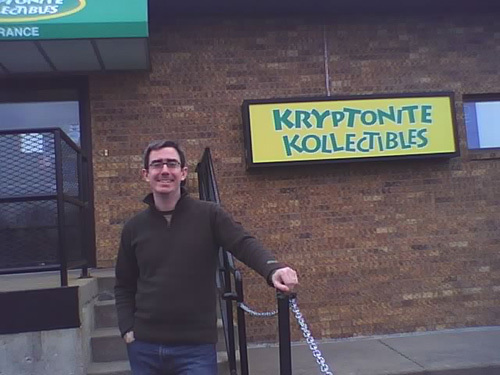 Kryptonite is a collectibles shop for everyone. The store has a large selection of sports collectibles, a good selection of games, and a good selection of comics frontlist product. They have a strong RPG area, well organized and easy to shop, and featuring all the Goodman Games 4E releases. I picked up several new comics while I was there, too. The store just moved to a large off-mall location in a new building with its own gazebo out front and a large gaming room downstairs that can accommodate 40+ gamers. 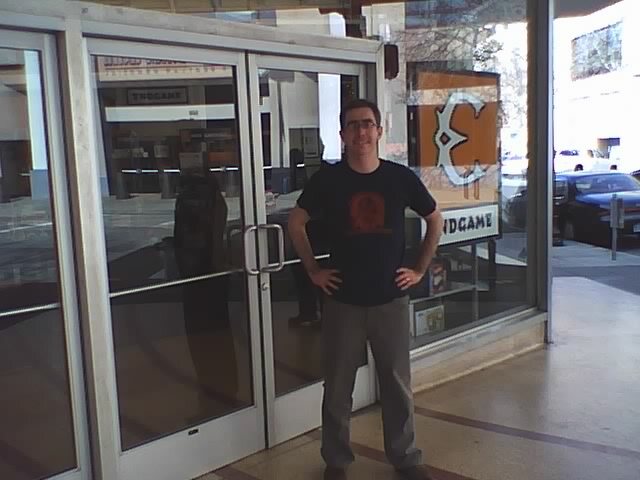 The store looks great and I hope I can make it back in the summer for the grand opening BBQ they were talking about! 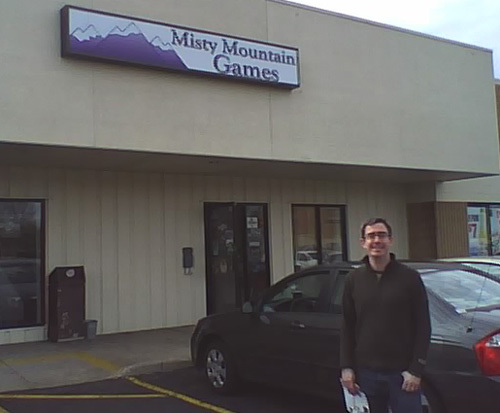 I've talked to the Misty Mountain guys every year at the GAMA Trade Show without ever knowing exactly how large their store is. I believe it is the largest game store I have ever seen. Dave, the owner, told me it's 6,000 square feet, 4,000 of which is game space. It's truly impressive - almost like a warehouse masquerading as a store. The back "hangar area" is a huge open space for cards and miniatures, and there are also two closed-door rooms in the front that are set aside for RPG play. There must have been more than 50 gamers in the card/minis area when I was there, plus one group in an RPG room and somebody running a demo up front. It is great to see this many gamers enjoying the hobby. On the RPG side they have the DCC spinner rack still stocked with some 3.5 modules, although their 4E selection was missing some titles. (This is because they sold, which of course is good, so Dave was putting in a re-order.) There's a broad assortment of popular board games, card games, RPG's, and other such. The most amazing thing I saw -- and pardon my predispositions here -- was the even gender balance among the gamers in the back. It was predominantly male, as most game store populations are, but among the 50+ gamers were a fair representation of female gamers, most of them playing CCG's. Based on first impressions, Misty Mountain seems to be doing a great job of promoting the gaming hobby to new customers. 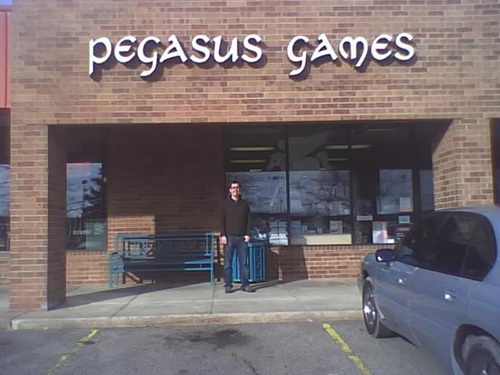 Pegasus is a great all-around game store that is nearing its 30th anniversary. Any game store with that kind of history deserves recognition. The store is organized and well-presented, stocking a good selection of all gaming categories - cards, RPG's, board game, and miniatures. They have the full selection of Goodman Games 4E products, and a ton of other RPG products to boot. Cthulhu products are popular here, and they were excited about the Age of Cthulhu line. There's gaming space in the back, and they had our new "Your Source for D&D 4E" poster hanging on the wall. Plus there's good luck in this store -- I got some good pulls on my Star Wars miniatures purchases! Yay Madison! I used to play cards at Misty Mountain when I lived there. Good times. And Pegasus Games is the basis for Pegasaurus Games in Dork Tower. I was down in Philadelphia this morning, getting some ink at one of my favorite tattoo places. 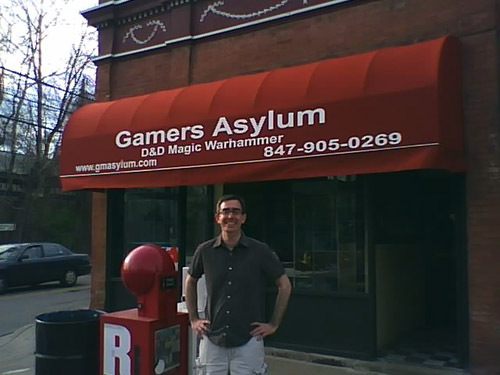 For some reason, I remember Adrian Pommier telling me about a game store called "All Things Fun" in West Berlin, NJ, which isn't that far away from Philly. So I decided to check it out. The store has a great selection of comics, board games, and roleplaying games. It's clean and well-organized, making everything easy to find ... and if for some reason you can't find what you want, the staff is very knowledgeable and helpful. Lots of stuff for 4E and for Pathfinder on the shelves (I found the whole collection of "Punjar" modules on one of them), as well as a whole bunch of White Wolf games. Better still, there's a lot of gaming tables in the store ... gaming tables that get used. While I was checking out the shelves for new games, I noticed a group playing 4E, and a couple other folks playing a variety of card and board games. If you live in the area, All Things Fun looks like a great place to find other gamers. I managed to pick up the "Black Goat of the Woods" expansion for the Call of Cthulhu board game, as well as some new dice. It's a great store. If you live in the area, check it out! 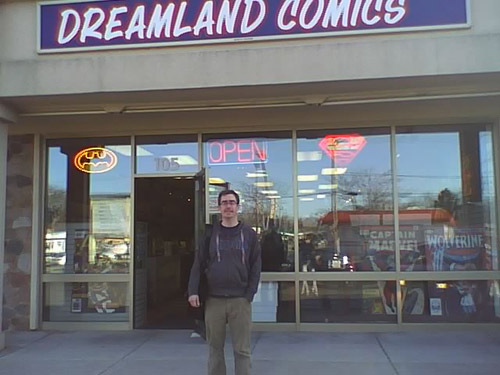 Chicagoland has two stores called Dreamland Comics, which are unaffiliated despite identical names. The Dreamland in Libertyville is a well-stocked comic store with a large display of new releases for Marvel and DC, and a smaller area for new comics from other publishers. They have a well-organized library of graphic novels, including all the "Essentials" from Marvel. Their gaming selection covers Warhammer 40K in depth, a smattering of board games, and the basic D&D 4E books from WotC. They special order other RPG's upon request. 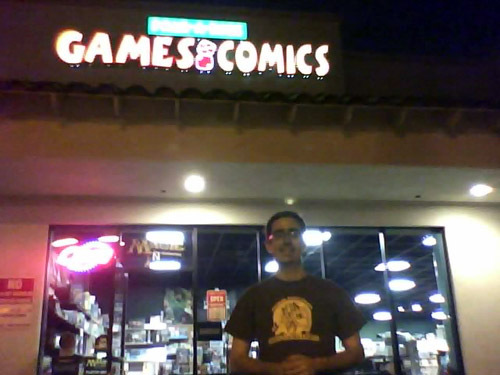 Overall it's a good comic store with an up-and-coming game section. 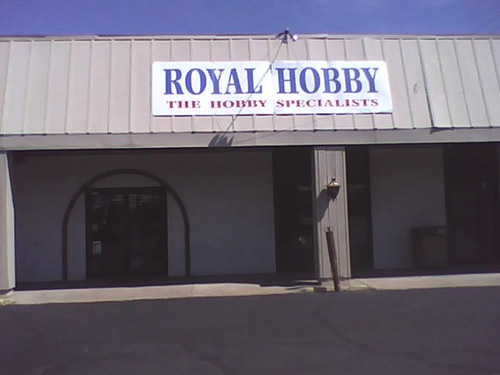 Royal Hobby is one of the oldest hobby shops in the region, with nearly 40 years in business. Over the years, its four long aisles have been stocked with every conceivable hobby trend, including a full aisle of RPG's in the late 70's/early 80's when D&D was the new fad on the block. They still have one aisle dedicated to miniatures and RPG's, alongside a huge selection of model airplanes and other hobby materials. The owner, Ken, has been playing D&D since its earliest days, and is knowledgeable about all things grognardia - including the illustrations in the original 3 OD&D books from 1974, since one of the original artists works at the store! Royal Hobby Shop is a classic midwestern hobby shop, a great place to spend your time in a land of long winters. Another great addition to the Chicagoland gaming scene, Gamers Asylum is a year-old gaming shop just off the campus of Northwestern University. The shop continues to expand, and just moved down the street. Their new storefront is spacious, with lots of room to maneuver around the large gaming area directly inside the front windows. They also have more gaming space in the back. The store carries the core selection for D&D, Warmachine, Warhammer 40,000, and a variety of other product lines, and is on its way to becoming a fixture in Chicago gaming! 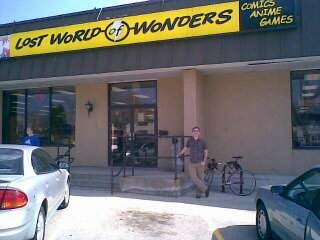 Lost World of Wonders is a full-line comics shop in Milwaukee. I love the fact that they stock deep on new and recent comic releases. One of my challenges as a comics collector is that I don't make it to the shop every Wednesday, so I often need to buy several weeks' worth of new releases at a time. Many comic shops stock the recent releases light and sell out by the time I make it in, so I'm stuck missing random issues of a run. When I visited Lost World of Wonders I was able to stock up on random issues of several of my favorite series, since they had hefty quantities of the last 4-6 issues of just about every comic I read. They also have a huge TPB selection and in general are a large store. As far as gaming goes, they have a selection of cards, and a back room used primarily for card gaming. Their RPG selection is currently limited to the WotC 4E books, although they participated in the Goodman Games Level Up promotion for Worldwide D&D Game Day and are looking at bringing in the whole line. Joseph, I think you are doing these businesses a wonderful service. Keep it up! 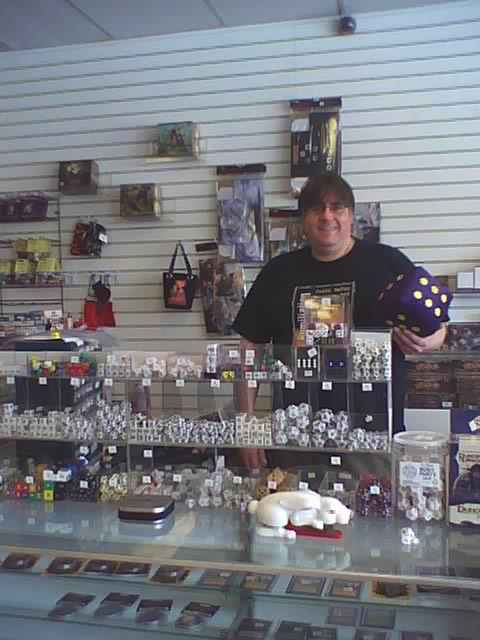 "More dice than any other game store in the midwest!" That's what the owner James says, and I daresay he's right! 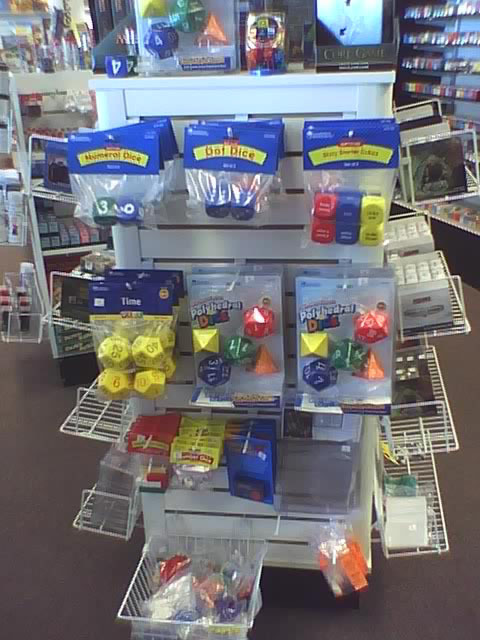 Below are photos of some of the store's dice selection; there's at least one other complete fixture that I didn't photograph, as well as the other half of the cash wrap. They even manufacture their own custom-made dice that aren't available anywhere else. I picked up a couple "cheater's dice" myself, including a d20 with two 20's and no 1. Critical hits, here I come! Game Universe is a fun store, especially if you're a role-player. 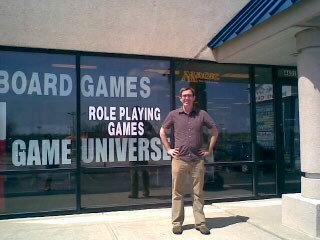 They have the largest RPG selection of the five Milwaukee stores I've visited, including about six feet of wall space dedicated to Goodman Games. Almost all of their RPG's are shelved face-out (as opposed to spine-out), making the RPG's very easy to shop. Their selection includes 4E as well as a huge assortment of 3E products, and they actively stock used copies of the Wizards 3E core rulebooks. Yes, that's right, you can buy a third edition PHB or DMG here, as well as third edition supplements from all sorts of publishers. 3E lives on at Game Universe! Outside of the dice and RPG's, Game Universe also has a wide selection of board games, an assortment of RPG-oriented miniatures from Reaper, and a couple tables of gaming space in the back. It is a great game store for gamers. 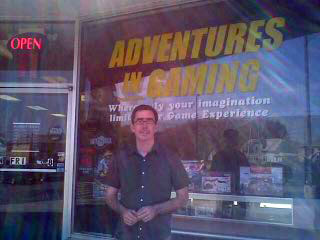 Adventures in Gaming is a spacious full-line game store with an emphasis on miniatures. It consists of a 2,400 square foot main floor and another 2,400 square feet of basement gaming space. The walls of the main floor are almost entirely lined with miniatures, including complete selections of every current miniatures game that I could think of offhand, as well as some import lines and a selection of resin and plastic scenery kits. AIG also has some board games and a wide selection of primary RPG publishers, though I didn't see a lot of third party or "indie" representation; the store's focus is definitely miniatures. There are gaming tables on the main floor. In the basement, there are 6-8 game tables, many with some high-quality scenic terrain for miniatures gaming. I like the fact that the basement gaming space has a bulletin board with flyers from local takeout restaurants, and a "You Are Here" notice with the store's address posted nearby. You can tell the local gamers spend a lot of time at this store, gaming and eating pizza! Cavalry Games is one of those game stores that is packed to the brim with products and then has gaming squeezed into that! When I was in the store they were running a Magic tournament with about 10 guys and had literally packed people into every available space to get the game going. The walls are filled with board games as well as a selection of Games Workshop and other miniatures. They have a limited RPG section, mostly focused on the core 4E books, since their primary businesses are cards and miniatures. I was personally impressed by their point-of-sale system. They record customer email and snail mail address, and you check out by giving them your email addresses. They have a rewards system that's tracked via the email addresses, and customers get coupons as they accrue rewards. The coupons are then emailed to the customers as they receive them. All in all it's pretty slick. Board Game Barrister has been on my list of "stores to visit" for several years now. I've always heard great things about it being an example of a well-run mall store. After visiting the store I have to say I agree. It is a mall store, meaning it focuses on mass-market games with limited overlap to "gamer games" - these are not quite the same as the products most gamers would buy at Gen Con. They have a very limited RPG and miniatures section, focusing mostly on board games as well as children's toys and educational products that you won't normally see at a game store. 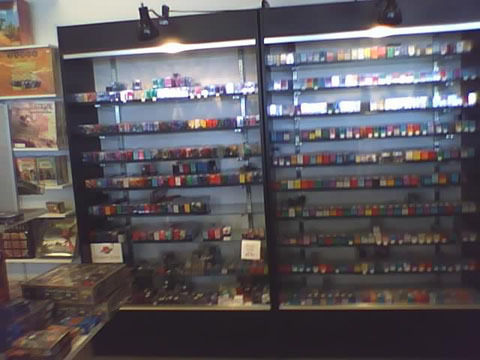 But that's a good thing; this is the kind of game store that serves as outreach for the industry, pulling in the mass market and introducing them to the products that serve as a gateway to the hobby. 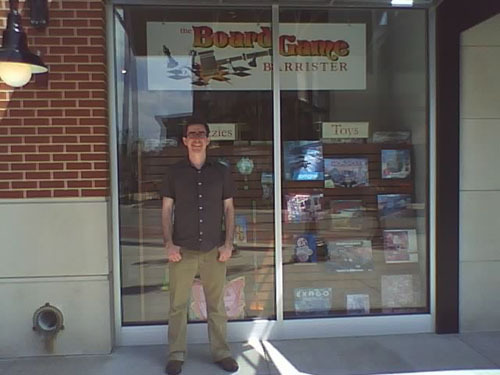 Board Game Barrister is clean, well-lit, spacious, easy to shop, and staffed by helpful, friendly employees, with a terrific selection of family game products, and enough basic selection of RPG's and miniatures to fulfill the special orders of any local gamers. 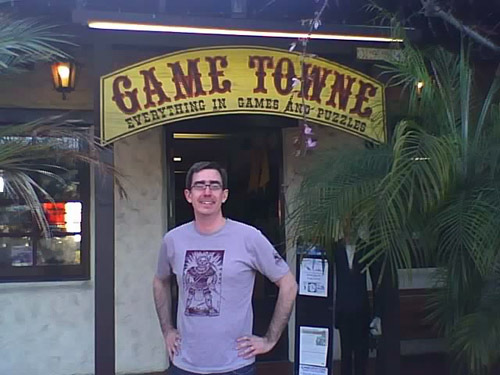 Game Towne is a store located in San Diego’s Old Towne, where it is soon celebrating is thirtieth anniversary. 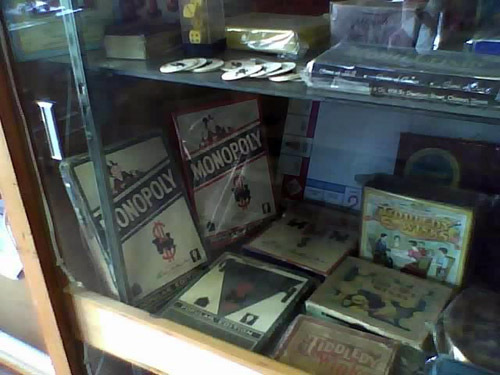 The storefront opens into a large selection of traditional family games, including mass market titles like Monopoly and Risk. 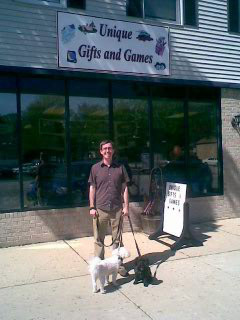 Walk a little further and you find the “gamer games,” including miniatures and an extensive RPG section. The RPG’s are shelved face-out so they are very easy to shop. I’ve seen other stores that could fit more titles by shelving them spine-out, but Game Towne makes them very easy to browse because the cover always faces the customer. Their RPG’s are still heavily focused toward 3.5, and most of the 3.5 products are 30% off. Game Towne also stocks the Spanish-language editions of the core D&D 3.5 books. Game Towne also has a large selection of Starfleet Battles products and related accessories. And I mean, large! There is more Starfleet Battles / Star Trek gaming merchandise here than in any store I can remember visiting. They even have a line of Star Trek plastic miniatures imported from Japan and still in the Japanese packaging; I’ve never seen these elsewhere. There’s a back room with 3 gaming tables and a library of board games, as well as a small demo table in the selling space. My favorite part of the store, however, is the display of antique games. In a glass case in the rear section of the store, the owner has displayed his collection of classic games. This includes several printings of Monopoly from the 1950’s, as well as other games no longer in print. Some of them are more than 100 years old. I have seen stores selling vintage D&D books before but never before such a collection of game history. It’s a neat addition to the store. Game Empire: Land Of A Thousand Games! I like the audacity in that title, and Game Empire delivers. The store sells board games, miniatures, RPG’s, card games, and some family games (puzzles, chess, and the like) in the back. But the focus is clearly on miniatures. Even though the board games greet you when you walk in, the largest amount of floor space is dedicated to an impressive selection of Games Workshop product, and a wall of Warmachine. Game Empire stocks more Warmachine than any other game store I’ve visited. They stock the full assortment of Woodland Scenics materials for miniatures aficionados. They also have a well-organized selection of Reaper miniatures where each row of hanging racks is dedicated to a different D&D character type. There’s a row of elf miniatures, a row of fighters/barbarians, and so on. This is a store that understands what their customer is looking for. The open gaming section takes up about 1/3 of the store, and has a half-dozen tables. There are clearly regular tournaments being played here, and behind the counter are the store’s very classy trophies from prior events (with the winners’ names printed on them). The open gaming area has several huge displays of painted miniature armies. Not just painted figures, but entire armies, and they’re painted to a very high standard. (Game Empire rents the display cases to customers, so they can store their armies here in the store instead of transporting them.) There is a game library for use in the open gaming area (including older RPG’s from the 1980s and D&D 2E books), a wide variety of bitz boxes, and a HUGE selection of miniatures terrain for both fantasy and sci-fi games. Pair-A-Dice Games and Comics is a game store that became a games and comic store which is now going back to just games. They still have a healthy supply of trade paperbacks, many at discounted prices if you’re looking for a deal. On the game side, they have a large selection of board and card games, including the largest Munchkin selection I’ve seen in a game store. And if you buy a certain amount of Munchkin product you get a free Munchkin T-shirt! The miniatures section is primarily Games Workshop and Privateer Press. RPG’s are shelved on a couple bookshelves spine-out, with D&D and White Wolf games being the primary focus. They have 3.5 Goodman Games product and now are thinking about bringing in the 4E line. About a quarter of the store’s total square footage is devoted to gaming space off in a side room, which was filled with lively gamers when I was there. The staff is very friendly and welcoming, and we had a great chat about the business. 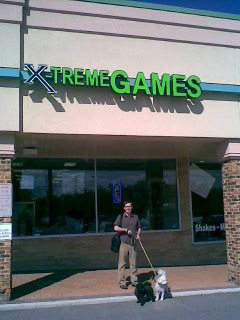 X-treme Games is a game store focused on gaming first, product second. It has a greater percentage of floor space devoted to gaming than most other stores I've seen. 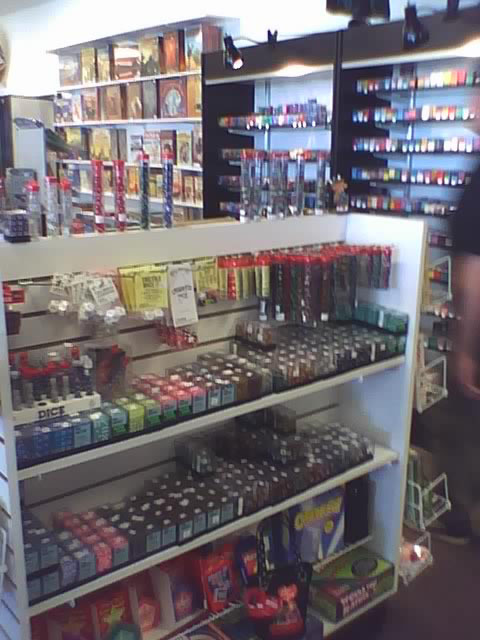 The front of the store has two tables for miniatures gaming; there's a section for computer gaming in the middle; and then the back has seating for at least 50 gamers at tables suitable for card or RPG gaming. The store has been growing rapidly and recently moved to a new location where they're steadily bringing in new store. Their primary focuses are Magic and card games, D&D 4E, and Games Workshop miniatures -- at least for now. Over the coming months they're looking to expand into all the space allowed by their new location. 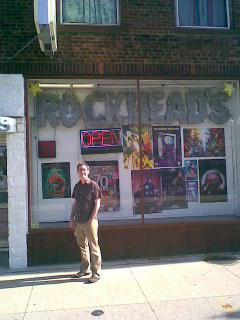 Rockhead's is a large comics and game store devoted to gaming, gaming, and more gaming! The store is much bigger on the inside than you'd think from the outside, filling a long space whose center is lined with a row of tables. When I visited the store was filled with gamers playing RPGs and miniatures. The gaming selection includes a large RPG section and a good selection of miniatures, cards, and board games. In the back there is also a complete comic section, with back issues as well as new titles. The owner actively games and was running a delve when I visited -- always a good thing, in my opinion! The RPG area includes a wide variety of backstock from prior editions as well as current editions, including some fun classics like It Came From The Late, Late Show. Unique Gifts and Games is a full-line game store tucked away in the place you'd least expect it. On a quiet small town main street, this shop offers a good selection of miniatures, cards, RPGs, and board games all in one store, along with gaming space. The store also has a gift section focused on gems, statuettes, and other such things. One twist that I like is the selection of fantasy novels that they offer, which is a natural crossover with games but one you don't often see represented. Another thing I noticed is that they carried accessory products for the larger lines -- for example, they had Litko tokens related to some of the miniatures genres they carried. This is a sign of a store that pays careful attention to the needs of it customers. The walls are plastered with game-related posters, which I love -- it was like having gamer eye candy all around, just waiting to be ogled. When I visited there were two boisterous games running on the tables in the back, and it was clearly a community-oriented store since one of the owners was playing in one of the games! 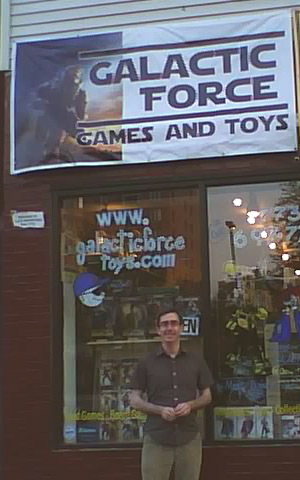 Galactic Force is a new toy and game store in the Chicago Wrigleyville area. The store is new but growing, and clearly dedicated to building a strong local gaming community. They've signed up for Free RPG Day in their first year (bravo!) and are running games in a separate rental property adjacent to the storefront. This is a real sign of commitment: they're actually paying more rent to run games in a separate property. The store's selection is focused on core items at the moment, primarily CCG's, collectible minis games (like Star Wars), some board games, and the core WotC D&D books. They also have collectible toys, including a full assortment of G.I. Joe figures. Joe, what are those dogs in the pictures? Is one a poodle? Those are my dogs, Warhol and Liam. They're both poodle mixes, or as I prefer to say, demi-canine.